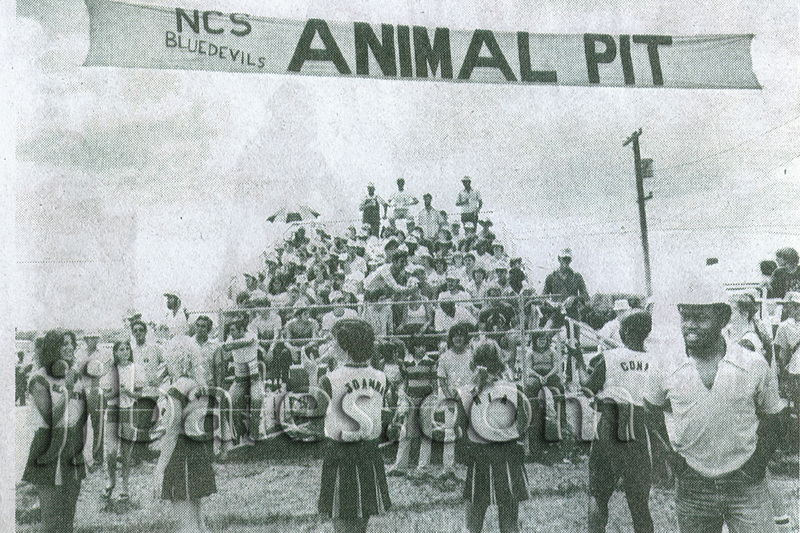 Military Memories - 1978 NCS Guam Football - "The Animal Pit"
Home > Military Memories > 1978 NCS Guam Football - "The Animal Pit"
1978 NCS Guam Football - "The Animal Pit"
The Animal Pit was the raucous cheering section in the late 1970's for the NCS Blue Devils football team, who competed in the Guam Varsity Football League. Sports were a big part of the culture on Guam and this adult tackle football league existed for many years from the 1960's up until the late 1980's. The Blue Devils played against teams from across the island including the Anderson AFB Bombers and the University of Guam Tritons. I believe other teams were from Naval Station Guam (Big Navy), Camp Covington (USMC), and NAS Agana. My parents were a part of this group of diehard fans, who had there own set of bleachers at the NCS football field. Don't you dare enter the Animal Pit bleachers without a Blue Devils hat. If you were so foolish you would be serenaded by the whole section with, "You gotta have a hat! You gotta have a hat!......" It was endless until you took action. Your options were simple: buy a hat or depart the bleachers. The group also traveled to the away games and made quite an impression. I remember one day game at the George Washington High School stadium against the Tritons when after the game the local fans started shaking the NCS fan bus and throwing debris. And the Tritons had won the game!! I also remember running around at the night games when NCS played their bitter rivals at Anderson AFB. Those were some fun times.